TheRustedChain - The Blog: Done. As of today, we are done taking orders for Christmas delivery. Any orders received after today may be delayed in shipping. I just have to take a break and spend time with my own family. That is the entire point of having a family owned business! We have been overwhelmed at how successful you all have made this year! I think in January I need a vacation. Just me and a friend. Somewhere tropical. And a fruity drink or 7. Ahhhh, that would be so nice! Sounds like you deserve that vacation with all the ammenities..and 7+ fruity drinks! beki~i have found your blog from your beautiful work! i have loved your focus on Christ and family!! i believe that is why God blessed your business so much this year :) i giggled when i read this post and knew i had to share...i did the same thing, more business+money=really nice, but i would rather be with my family and so i put a halt to orders and plan for a calm season here(once everything is shipped;))! may the Lord bless you again! you NEED a break! good for you! Noone has signed up yet? Count me in. I'll be a whole month from having the baby....no problem. :) If you take me, you don't have to share the fruity drinks either! We can go anywhere you like....California. Hawaii. Whatever. I'm game. I agre with the vaca part-the beach sounds LOVELY right now! london in january is the most tropical place i've ever known. hollaaaa!! I'll watch your babies :-D You really do need a vacation!!!! I can't get enough of Drew's sweater- and I love that I get to see it every so often in class! He's the best. And you are too. I will be closing my shop on Sunday. I am looking forward to the break and time to create for myself and family. Great photo of the kiddos. Merry Christmas - enjoy your time off! I vote "yes" to the fruity drink or 7. 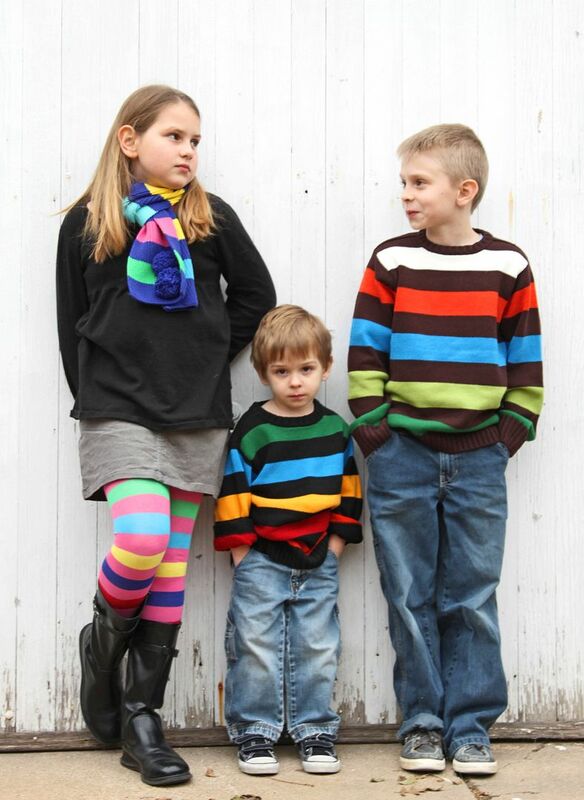 Love those stripes on your kids! Glad you're going to be able to take a break and slow down a little. My friend and I invented what we call 'The Redneck Spa' on my back patio this year. We had a blast and it didn't cost us anything, except a little nail polish and some fruity drinks! I know it's not the same as going somewhere tropical, but it sure was fun to have some girly time. Love the stripes...I'm a stripe addict. I'm very friendly and could even be considered a friend. I volunteer! lol Congrats on such a successful year! love, love the stripes - this could be a Christmas card! look at those three little different attitudes! so cute.